Now that you’ve found a great way to leverage your own procrastinating habits, it’s time to go to Step 2 of our procrastinating-buster bootcamp. Two of my favorite quotes from Tim Ferriss’ 4-Hour Workweek are that “Doing something unimportant well does not make it important,” and “Requiring a lot of time does not make a task important.” This latter quote is the one we will be examining today. Vilfredo Federico Damaso Pareto was an Italian engineer, sociologist, economist, political scientist and philosopher. He made several important contributions to economics, particularly in the study of income distribution and in the analysis of individuals’ choices (thanks Wikipedia). Pareto’s name might be unfamiliar to you, but his principle (also called “Pareto’s Law”) is relatively well-known. Basically, after observing numerous phenomena ranging from land ownership to pea pods, he came up with what became known as the 80/20 rule: for many events, roughly 80% of the effects come from 20% of the causes. This is so important that I’ll repeat it again: 80% of the effects come from 20% of the causes. So, how does this relate to procrastination? As Ferriss says: “Slow down and remember this: Most things make no difference. Being busy is a form of laziness—lazy thinking and indiscriminate action. Being overwhelmed is often as unproductive as doing nothing, and is far more unpleasant. Being selective—doing less—is the path of the productive.” So here’s our new mantra: less is more. This has tremendous implications for learning a skill, as well as for avoiding the procrastination pitfalls that taking in too much brings. Have a few, clear-cut goals, and find the 20% that brings you 80% of the results. In language learning, this would be something around the lines of learning, from contextual material, the top 1000 or 2000 most commonly used words in the dictionary (See Wiktionary: Frequency lists), as well as getting five to six hours of private conversations with a native speaker per week, on a website such as www.italki.com. It’s cheaper than you think (learning Chinese can cost you as low as $3 an hour with a private tutor over Skype; as for teachers, you are spoiled with choice). By following these few simple steps, you’ve already eliminated the bulk of the boring type of stuff you would normally be doing when learning a language, such as finding the definitions of the words “hierarchy”, “blatant”, and “pinnacle”, or skimming through a grammar book. Less (boring) stuff to focus on means less reasons to procrastinate, and this, coupled with more important stuff higher up on your list besides learning a language (or any other skill you might be thinking about learning), will ensure that you’ll get pretty awesome results. Lastly, everyday ask yourself these 2 questions at least 3 times a day: Am I being productive or just active? Am I inventing things to do to avoid the important? I suggest writing those on post-its and sticking them in front of your computer monitor. Now that you have a tool to structure your procrastination (say this at a party and you’ll sound very cool: “Yeah, nowadays I’m structuring my procrastination to get more stuff done, you know), and that you have an idea of how to focus on the stuff that actually matters and that will produce 80% of the results while working 80% less, we will need to cut down on the time allocated to the actual tasks we need done. “What? You’re saying that I can work 80% less and in less time and still get good results?” Yup, that’s exactly what I’m saying. How many times have you woken up 30-or-so minutes late, only to find out that you managed to do exactly all the things you usually do in your morning (such as showering, eating, commuting) without arriving late to work/school? How many times have you had a really tight deadline (probably because you procrastinated until the day before the due date), and yet managed to turn in some reasonable quality work? This, my friends, is exactly what Parkinson’s Law is all about. I will come back to this concept (and the Pareto Principle) in later posts since it is such an important aspect of learning and productivity, but essentially Parkinson’s Law dictates that a task will swell in (perceived) importance and complexity in relation to the time allotted for its completion. It is the magic of the imminent deadline. The interesting thing is that the end product of the shorter deadline is almost inevitably of equal or higher quality due to greater focus. Think about it: does it make sense that most white collars in the world work 8-hour shifts a day? Who made this up? Does everybody really need 8 hours in a day to complete the work and tasks that they are assigned? Of course not. Most need perhaps 3 or 4 hours, perhaps even less if you’re a public servant. 8 hours is a random number. But the more time you give a person to complete a task, the more time that person will take to accomplish that very task. So next time you’re trying to learn, say, a language, a program such as Photoshop, or knowledge such as mathematics, try to give yourself less time to do these tasks. Ruthlessly focus on the task at hand (check out the Pomodoro technique if you need some time management assistance), and finish these tasks within the set deadline. The more time you give yourself, the longer you will take to complete your work. The longer you take to complete a task, the more time this will allow for procrastination. It makes sense, doesn’t it? The last main point I will write about today is that of making not doing something harder (or more painful) than doing the actual thing. This is a great motivation booster, and a great procrastination-busting method. His solution? Loss aversion. Would you work harder to earn $1000, or not to lose $1000? If research from the Center for Experimental Social Science at New York University is any indication, fear of loss is the home-run winner, he says. So how can you leverage loss aversion in order to do the damn thing you’re supposed to do and to stop procrastinating? Put money on the table. Tell your friends about your plans to learn Chinese. Tell them the specific means through which you plan on reaching your goal, and put money on the table, literally. If you fail to keep up with your plan, you owe them the money. A decent sum of money is necessary. Something like 5 bucks won’t cut it. Make it at least $100, or more if you can afford it. If you think you might not be honest enough to pay your friends in the event you would fail to complete what you put your money on, think about signing up to a website such as www.stickk.com. So, what do you think? 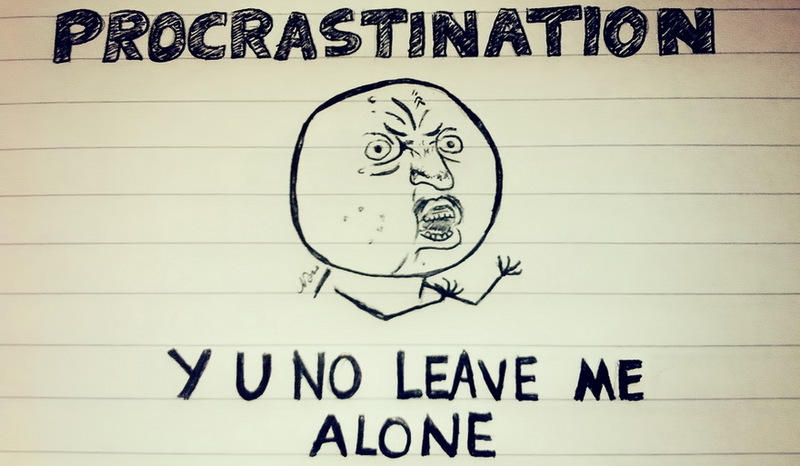 Are you a professional procrastinator? Have you had trouble doing stuff in the past? Are you being productive or just active? Are you inventing things to do to avoid the important? Are you simply giving yourself too much time to complete your tasks? Try out the methods mentioned in this post, and let me know how they work out! I’ll have to check Fiverr more in detail, it looks pretty nice, not just for language learning! The great thing about italki, though, is that you have the option to have a trial lesson with almost any teacher (you can only have one trial lesson per individual teacher). Often, a trial might cost you as low as $2 for 30min. And for an entire hour, regular classes over Skype for Spanish can easily be found for around $5, although a more typical average would be around $7-10. Still dirt cheap for private language lessons! I really liked the concept behind Parkinson’s law. I think we shouldn’t generalize, though. Less time is a challenge to me and it works fine, but some people get stuck when they don’t have much time. Sometimes having more time is crucial to achieve better quality. That’s true, although from my experience having more time means less focus. I think that’s why a lot of people get their work done at the last minute, under pressure. It’s because they know they have to deliver and focus comes along with this realization. Some people don’t handle pressure very well, so of course working under tight deadlines is not for everyone. But if somebody feels they lack focus and procrastinate too much, I would recommend him/her to try and work under tighter deadlines using good time management techniques (such as Pomodoro). Both Pareto Principle and Parkinson’s Law are so obvious (when you think about it) that I would have never realized by myself. I’m learning Italian at the moment, and I will try to use those two.